Climate change is creating challenges for grazing business resulting in more variable seasons and pasture growth.The Barossa Improved Grazing Group along with Coopers of Mt Pleasant and Farmer Johns have recently worked with producers over three years to develop a more reliable feedbase responsive to the changing climate through a Meat and Livestock Australia (MLA) Producer Demonstration Site (PDS) Project. 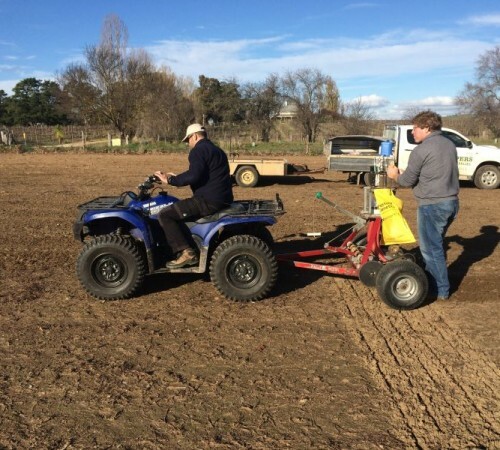 The aim of the project was to increase annual pasture dry matter production and total grazing days on 15 properties across four sub-regions in the Barossa and Eastern Mount Lofty Ranges by establising a feedbase that is optimised for variable rainfall patterns including late breaks, early finishes and out-of-season summer rainfall events. Site were sown at Ebenezer, with Farmer Johns and Pasture Genetics, and Eden Valley and Keyneton, with Coopers of Mount Pleasant and Heritage Seeds. On each site a range of different pasture types or blends were sown. These include perennial grasses such as the traditional phalaris and cocksfoot along with new fescue varieties along with older and newer vareties of sub clovers. Annual varieties including ryegrasses and forage cereals were also planted. Over the following seasons BIGG monitored the sites throughout year including groundcover, pasture composition, feed tests and dry matter production. Additional trial sites were also sown, and producer engagement activities were held including pasture walks, webinars and articles.